Orthodontic braces are used to straighten the teeth, which not only creates a more pleasing appearance, but can also make it easier to clean your teeth. However, braces are only effective when they are properly cared for and certain foods should be avoided to ensure the best results are achieved in the shortest possible time. Not only can eating the wrong foods cause you some discomfort, but you’re also at risk of breaking your brackets or wires which will require unscheduled trips to your orthodontist and may increase your treatment time. Additionally, if you frequently eat foods that can get stuck in your braces or are high in sugar content you will create an environment that encourages plaque and bacteria to thrive and this may cause lasting damage to your teeth. We’ll help you to understand which foods you should be eating throughout your treatment and which foods you should be avoiding. So, what are some examples of safe foods for braces? The best foods to eat with braces are those that are not high in sugar and do not require excessive chewing. For breakfast, try eggs, yoghurt, bacon, wheat toast, or oatmeal, and steer clear of crunchy granola. For lunches, substitute a banana instead of an apple, and try a salad without nuts or a simple sandwich, with a glass of water to wash it all down. If you are looking for some after-school snacks for your kids, consider baked tortilla chips with salsa and guacamole, or try string cheese with fruit. A healthy dinner can include most types of vegetables, so long as they are cooked to an appropriate softness. Pair that with a lean protein, such as fish or chicken, and follow up with dessert. Just be sure to brush afterwards! Anyone who wears fixed braces should avoid excessive snacking and should aim to eat a healthy and balanced diet. Some foods can also cause damage to your braces and should be avoided. What you can’t eat with braces are foods that are too hard which can cause the wires to break, while chewy foods can get stuck to the wires and brackets and tear them off your teeth. You should also avoid foods that are likely to get stuck in your teeth as this can make them harder to clean and breed bacteria. Regardless of what types of foods you eat with braces, it is important to keep the crevices between the teeth and around the braces very clean. That means brushing and flossing after meals to prevent the build-up of plaque and decay. Not only can failing to do so damage the teeth and gums, but it can also cause discolouration which can last a lifetime. 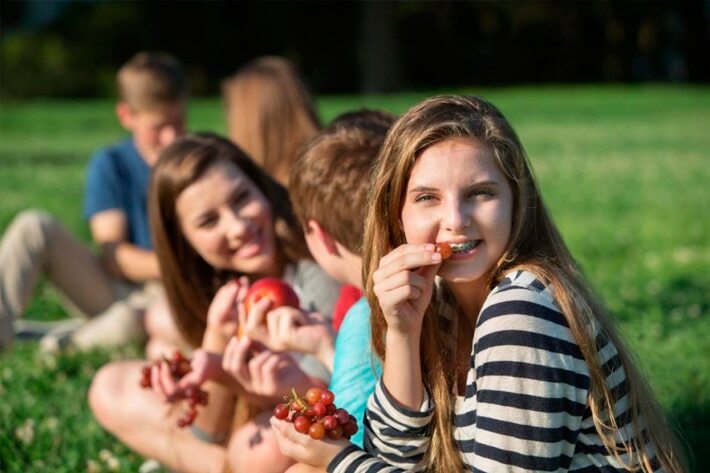 If you’re wanting to ensure the best results from your orthodontic treatment it is very important that you follow the advice about safe foods for braces that is set out above and ask your orthodontist if you have any questions about your specific treatment.